My favorite thing about galettes is probably their versatility: any time I have extra fruit on hand, I can simply toss the fruit with sugar and spices, wrap it up in a cozy dough and bake it until the juices are bubbling and the crust is golden. Of course, that’s pretty much what I do with pie. Except pie, well, it demands a little more attention. With so much fruit, the ratios start mattering; too much sugar makes it sickly sweet, too much liquid and no amount of over-baking will yield a firm pie. Sometimes, the top crust browns before the bottom crust has begun to bake and often, the process of making pie, from start to finish, can take a couple of hours. I still love baking pies. They’ll always be my favorite dessert to make. Nevertheless, a galette is the harried baker’s answer to fussy doughs and warm countertops. You get the same jammy fruits and buttery dough, but everything is just a little quicker, a little easier and a little less messy. This is my favorite apple galette. I laminate my dough for extra flakiness and rise and keep the filling as simple as possible, merely fanning out thinly sliced, quartered apples on the dough. I don’t even peel them (you can) and the whole thing take less than an hour to bake, after which I brush the apples with a vanilla bean flecked sugar syrup. It’s quick, it’s tasty, it’s purely apple and it’s exactly what I turn to when I need an elegant fall dessert. Happy October! 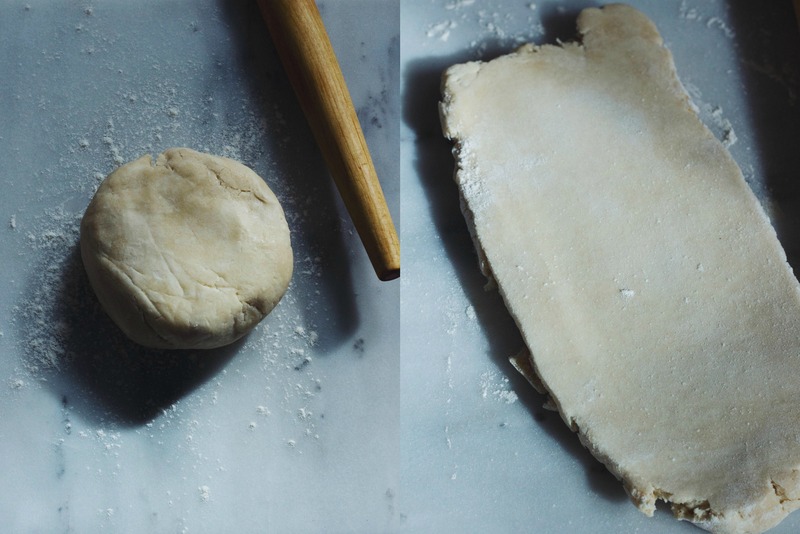 Why I love this recipe: here, I use my classic galette dough and laminate it for extra flakiness. It bakes up beautifully and supports the simple apple filling, which I keep spice free to let the clean apple flavors come through. In keeping with the simple theme, the apples are merely quartered, thinly sliced, and then fanned out on the dough. Once it’s baked, this galette is brushed with a vanilla bean syrup, for extra shine and flavor. If the dough seems dry, add more water a couple of teaspoons at a time. Press the dough together, form into a disc and wrap in plastic wrap. Chill the dough overnight in the fridge or in the freezer for an hour. Preheat oven to 400º. 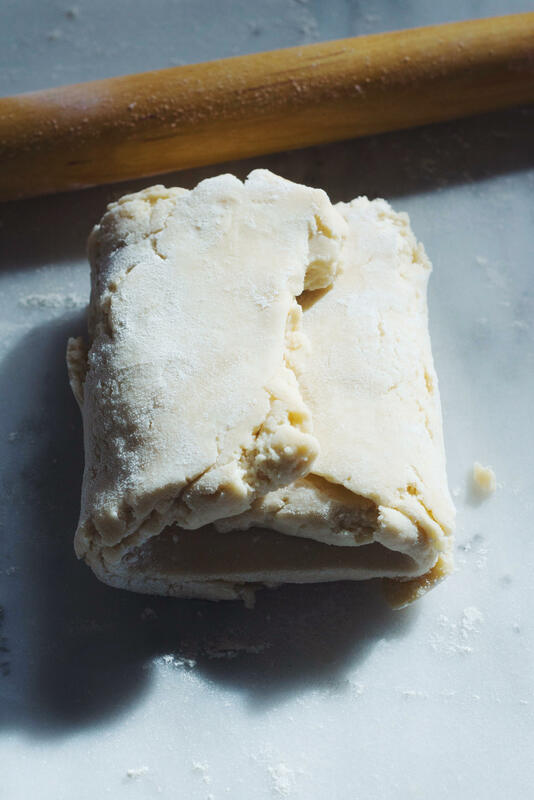 Remove the dough from the fridge/freezer and let it warm up slightly on the counter. Now, roll the rectangle into a 9″ circle. Cover the center of the dough with one of the three tablespoons of sugar. 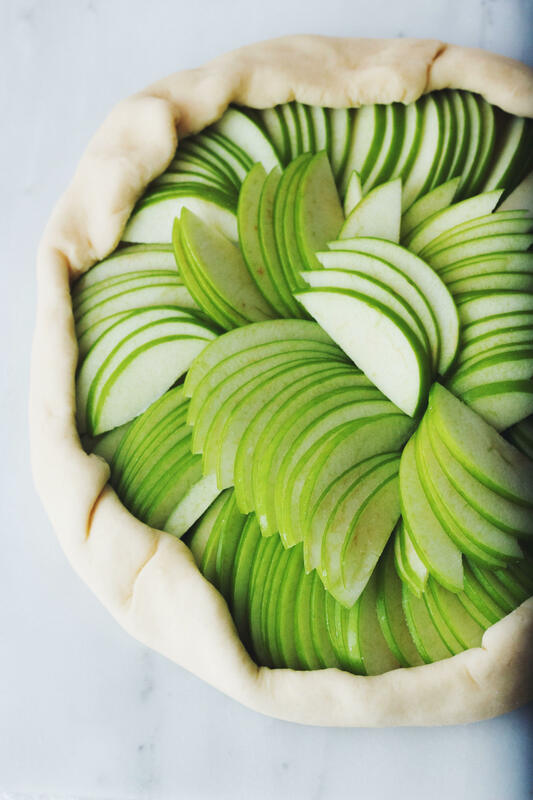 Fan out the sliced apples in concentric circles over the dough, keeping them as close together as possible. Fold the edges of the galette under to create a little rim. Press or crimp the rim over the apples. Using a pastry brush, brush the egg mixture over the galette crust. Sprinkle the galette crust with turbinado sugar. Bake in center of oven until apples are soft, with browned edges, and crust has caramelized to a dark golden brown, 35-40 minutes, making sure to rotate galette every 15 minutes. If the apples or crust are browning too fast, cover them with silver foil. While the galette bakes, combine the remaining 2 tablespoons of sugar with the water and the vanilla bean paste. Bring to a boil and let the sugar dissolve. Keep warm, on a low flame, until the galette is ready. When done, remove galette from oven, and slide off parchment onto cooling rack. Brush the vanilla sugar syrup over the galette with a pastry brush. 03 Oct	This entry was published on October 3, 2012 at 7:25 pm and is filed under Delectables. Bookmark the permalink. Follow any comments here with the RSS feed for this post.